Bring a sweater. The collections here are kept at 65°, which means it’s chilly. Even on the hottest 110° days, you’ll probably need an extra layer, but it’s for the good of the collections, so it’s worth it. There are really old books, maps, and other valuable pieces of history on paper, so it’s important to do our best to preserve them. Texas has really weird towns. 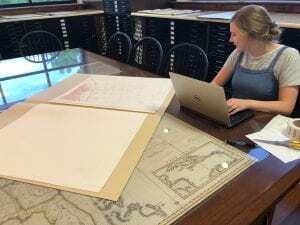 The Texas Collection has a vast map collection, housing about 14,000 maps of mostly Texas, and I worked with over 2,500 of them. Scranton, Movie Mountain, and Blanket were some of my favorites. You can take a tour of Europe if you’re interested, including towns like London, Paris, Oxford, Dublin, Edinburg, Florence, and Athens. If you don’t believe me, just head to the map room in The Texas Collection. The collection houses a very extensive array of maps, and another thing you might not know is how beautiful they are! From really old historical maps of the U.S. and Texas to maps of Waco, many research needs can be met in the map room. We are a photogenic school. If you need any historical pictures of Baylor or Waco, The Texas Collection can help you out. Maybe you work for The Lariat, maybe you need vintage fashion inspiration, or maybe you’re just upping your Instagram game – regardless the reason, the archives are your gold mine! If you are like me, and you aren’t the first in your family to come to Baylor, it’s especially fun to see photos of Baylor and Waco when our parents and grandparents were here. You should start your research paper here. Not only are the resources available valuable for your research, but the reading room is a quiet space for any studying needs. There is always someone at the desk to help you, and it’s a nice change of pace from the other libraries that can be crowded at different points throughout the semester. If you leave when it’s closing time, you get to hear the bells. Although Carroll Library closes at 5:00pm, one of the best parts of my days this summer has been on the walk back to my car. I try to leave right on time just to to hear the bells because it’s a fun reminder of how the history housed in The Texas Collection is still reflected throughout Baylor today. • Home to the first library at Baylor University and The Texas Collection, the plans for the construction of F. L. Carroll Library were introduced in 1901 and the then Chapel and Library were completed in 1903. • The first floor housed the library with special book collections donated by several individuals, including Dr. A. J. Armstrong. The chapel was located on the second floor of the building covered by a dome and decorated with stained glass windows. • On February 11, 1922, the Chapel and Library caught fire from an unknown source and destroyed the majority of the interior. Many students and faculty risked their safety to retrieve the library’s books and documents, saving over half of the total collection. • The building was renovated between 1922 and 1924; the chapel was not reconstructed and a third floor took its place. A basement was also added to the renovations, and many of the original stone and brickwork were kept intact on the architecture. • With the building running out of room, the central library was moved to the new Moody Memorial Library in 1968. • Over the years, various departments, the Strecker Museum, and the J. B. Tidwell Bible Library were located at Carroll Library for brief periods of time. • In 1992, a severe hail storm damaged many of the windows so the building was once again renovated and fully functional in 1994. • As of 2016, the building houses The Texas Collection, the Institute for Oral History, the Keston Center for Religion, Politics, and Society, and the J.M. Dawson Institute of Church-State Studies. Fiedler, Randy. “The Carroll Library Fire.” Baylor Magazine. Baylor University, Fall 2015. Web. 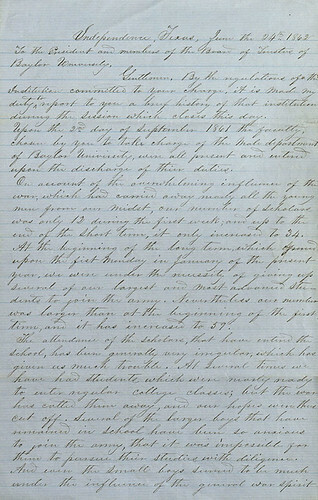 24 Mar. 2016. Amanda Dietz, “F. L. Carroll Chapel and Library,” Waco History, accessed March 24, 2016. GIF and factoids by Haley Rodriguez, archives student assistant. See these and other images of Carroll Library in our Flickr set. Before Carroll Chapel and Library could be declared done in 1903, the building needed furniture! 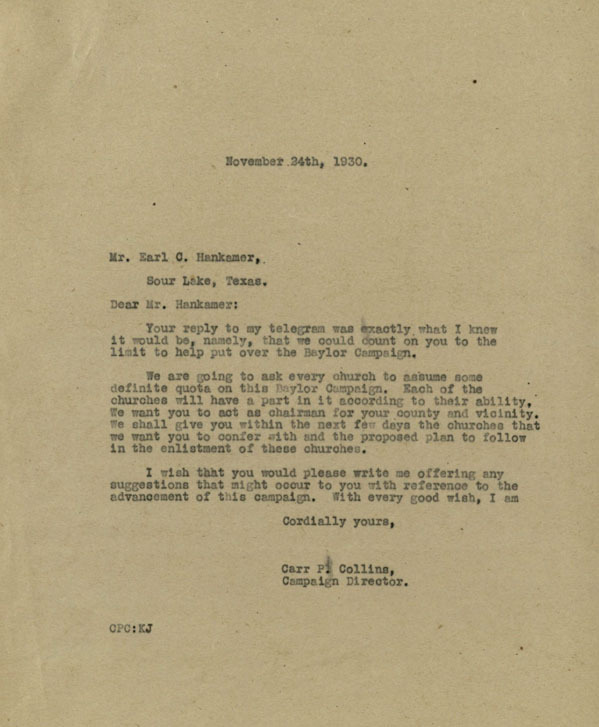 This letter solicits bids for Chapel seating, most of which would be lost in the 1922 fire. However, you still can see some of the pews in the corridors of the updated Carroll Library building today. BU Records: Carroll Buildings #BU/57, box 1, folder 1. 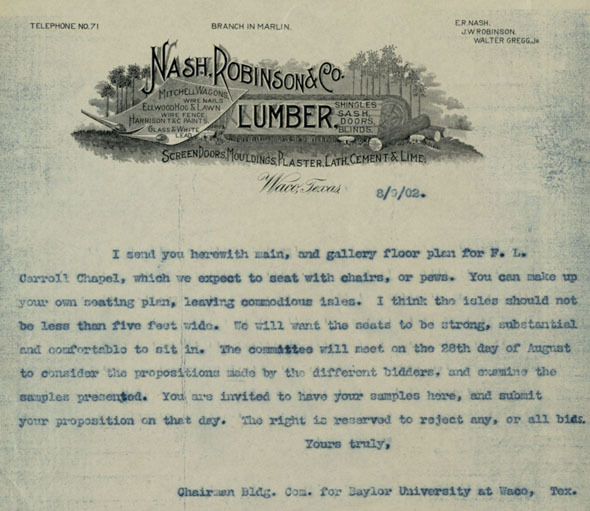 BU Records: Carroll Buildings, 1900-1903, undated (#BU/57): Correspondence regarding the furnishing of the F. L. Carroll Chapel and Library and the George W. Carroll Science Hall, as well as dedication programs from when the two buildings were dedicated. 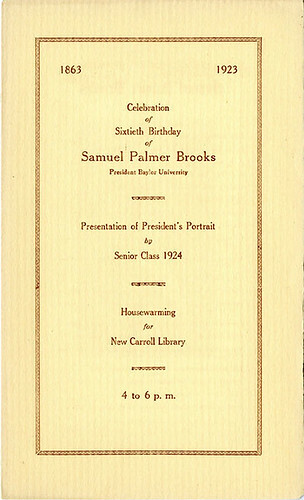 Carr P. Collins and Earl C. Hankamer were both noted Baylor Trustees and supporters. Here Hankamer pledges to assist with the Greater Baylor fundraising campaign. BU Records: Greater Baylor Campaign #BU/100, box 4, folder 2.